This page is all about going out and finding radioactive things, either in natural or human-made form. It's a word that is often misunderstood, but 'Radiation' has become a common word in modern society. For an attempt at a simple explanation of radiation, click here. Everywhere we go, we are constantly exposed to some kind of ionizing radiation, Some of this radiation is naturally occuring, and some of it is human made. 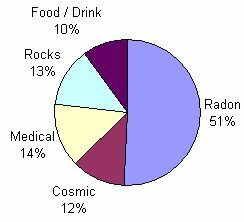 Naturally Occurring Radiation - This includes radiation in small amounts from radioactive rocks in the ground, radon gas in the air (which comes from the decay of Uranium in rocks in the ground), radioactive substances in everyday items (see below) and cosmic radiation from outer space. Human-produced Radiation - This includes radiation from plutonium and uranium deposited into the atmosphere and on the ground by various country's nuclear bomb tests, Medical X-Rays, plutonium powered satellites that have burned up and crashed to earth and contaminated land, food and water. It also includes contamination caused by 'accidents' at nuclear installations around the world. This chart shows the average population doses for the UK. Read about the Chernobyl incident here and the Windscale incident here. If you want to do experiments with radioactive things or go looking for radioactive things then you will need some equipment to detect the radiation. You can use the following things to detect ionizing radiation. The most common way to detect radiation is with a Geiger counter. A scintillation counter is a device which detects ionizing radiation in a different way and generally costs a lot more than a standard Geiger counter. A cloud chamber is an inexpensive method, see here how to make and experiment with one. Here at Aztec Research we use our Geiger counter Ivan for experiments involving radiation. You can either go looking for radiation in various everyday items or you can go straight to the source and look for rocks and minerals in the ground that contain radioactive elements, some of which are mined for their radioactive content. Click here to find out about everyday radioactive items. Click here to find out about radioactive rocks in the ground possibly near you.